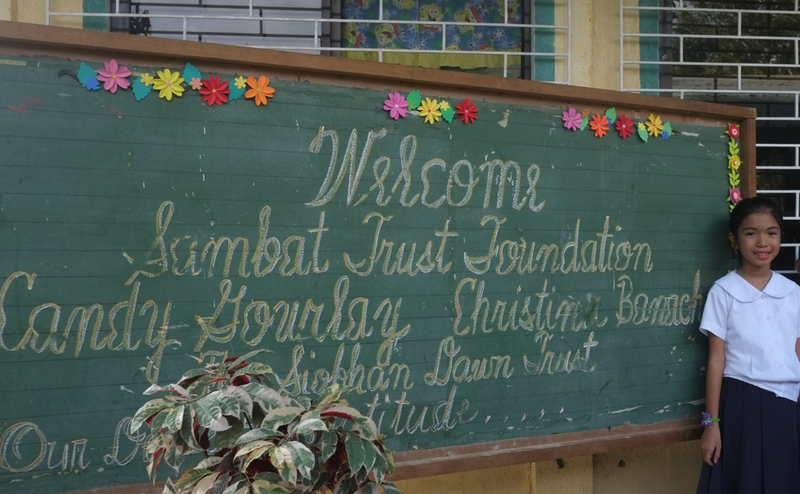 Visit a Sambat Trust School on behalf of the Siobhan Dowd Trust. 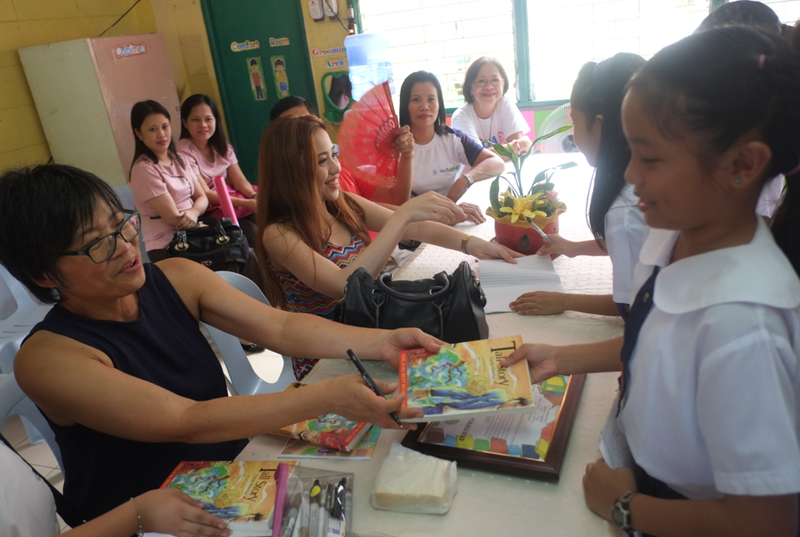 Donate a hardback copy of Shine to a Sambat Trust school on behalf of Tina Benipayo Andrews. 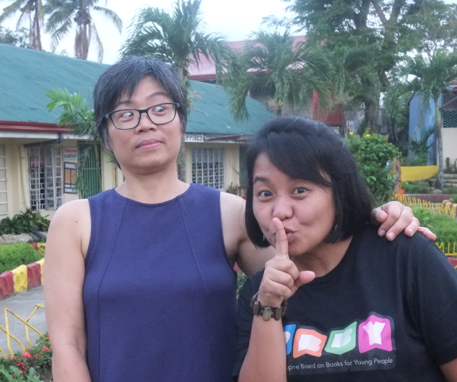 Far too early in the morning, I set off with Sambat Trust consultant and school librarian Zarah Gagatiga and my singing niece Nicole Q. My publisher Anvil and mother company National Book Store provided transportation. 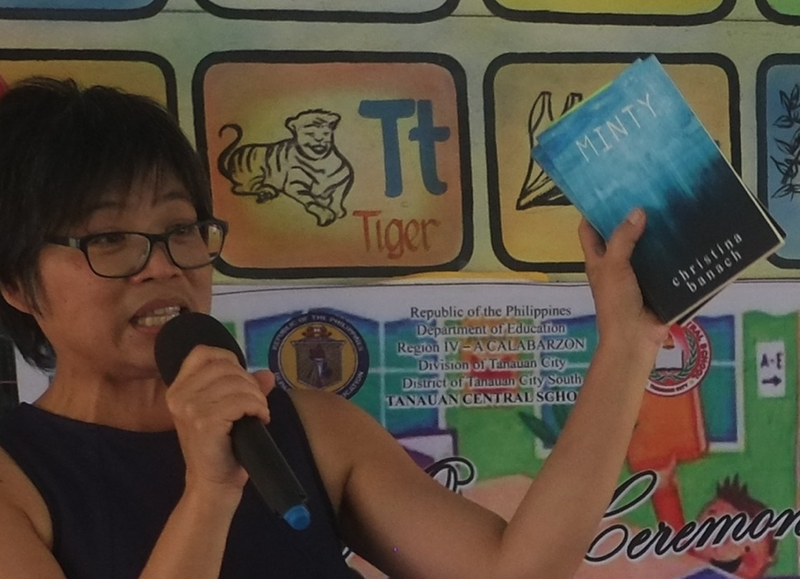 My Philippine mothership Anvil Publishing and National Book Store provided transportation to Batangas, about an hour's drive south of Manila. Thank you so much (especially thankful because flash flood traffic meant the return trip took four hours -- it was nice to be safe and comfortable in the Anvil van). 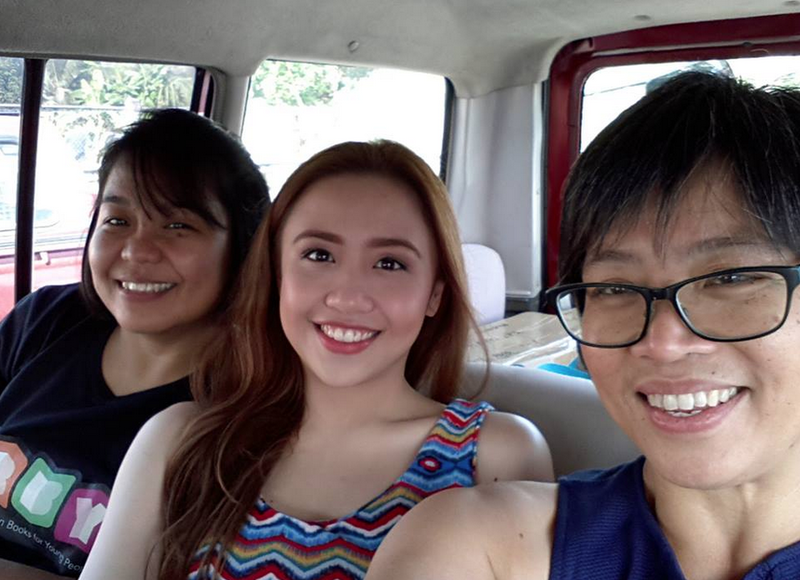 My niece, Nicole Q Ramos, came along to add a little musical sparkle. Nicole sings like an angel - last year she was nominated Best Newcomer at the 2013 Aliw Awards. 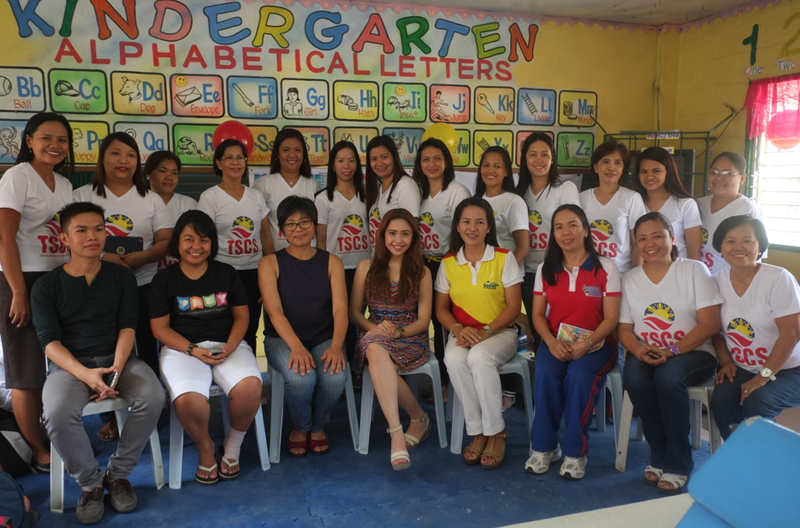 She also hosts the i-Sport and Home Court segments of PTV4. I taught her everything she knows about singing. And ballet. 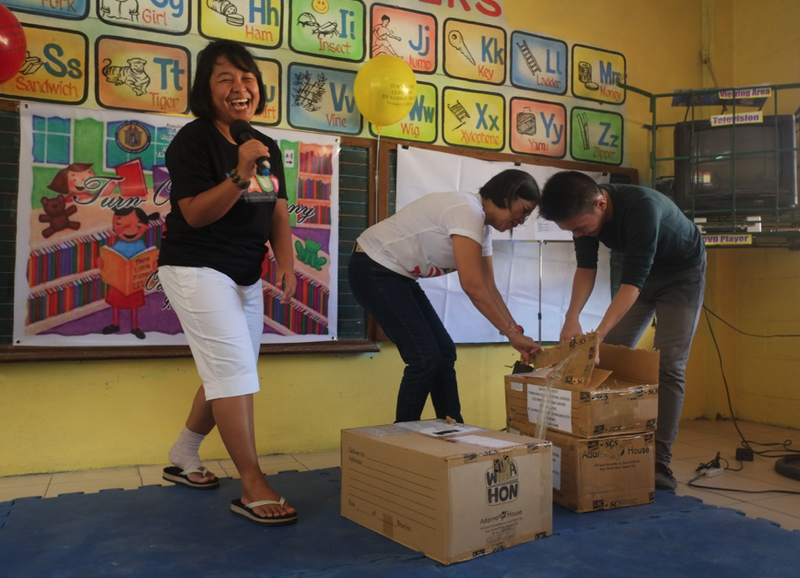 Zarah keeps the crowd entertained as extremely tightly wrapped donated books are released to take their place in South Central's new library. 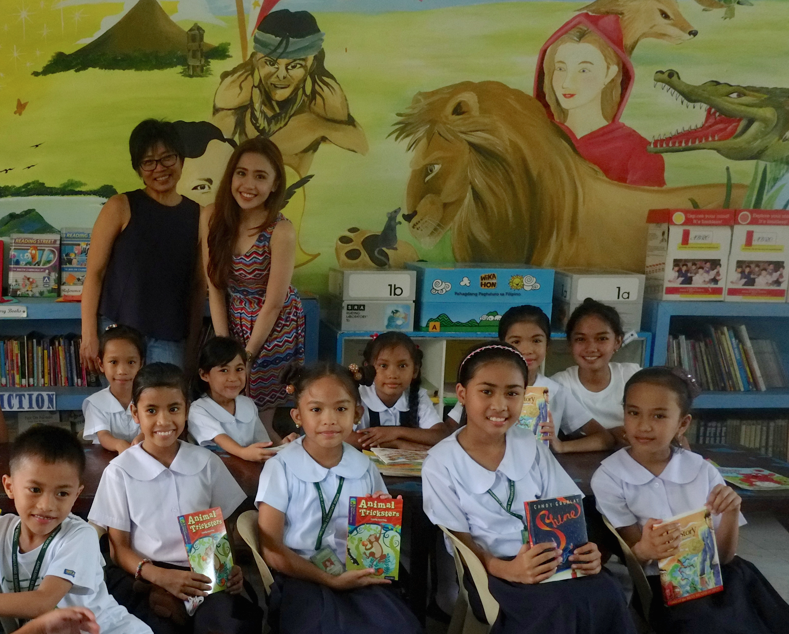 Author Xi Zuq aka MJ has been working with schools building their libraries. 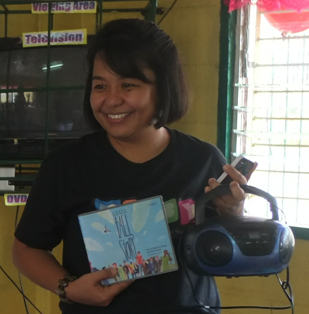 The librarians and teachers he was working with had no idea that their shy, unassuming Sambat Trust worker was an award-winning children's author! 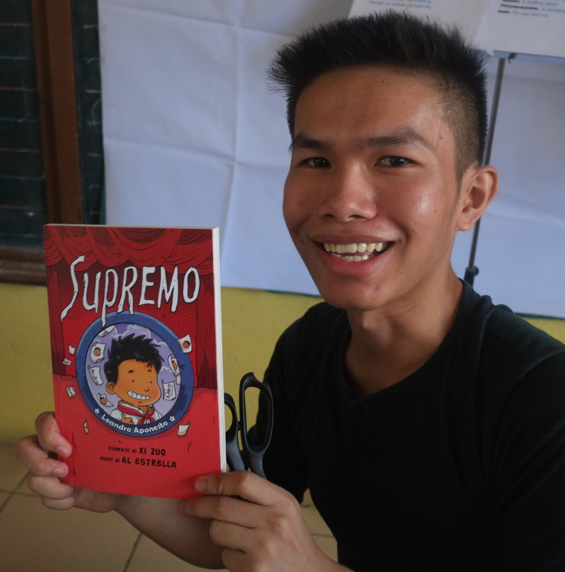 I grabbed a copy of his latest middle grade novel Supremo, about a boy whose ambition is to become a revolutionary style 'supremo' at his school. Can't wait to read it! But unfortunately I quickly lost my dignity. This tends to happen when I'm in the company of children. Siobhan Dowd Trust, this is what you're getting for your money. 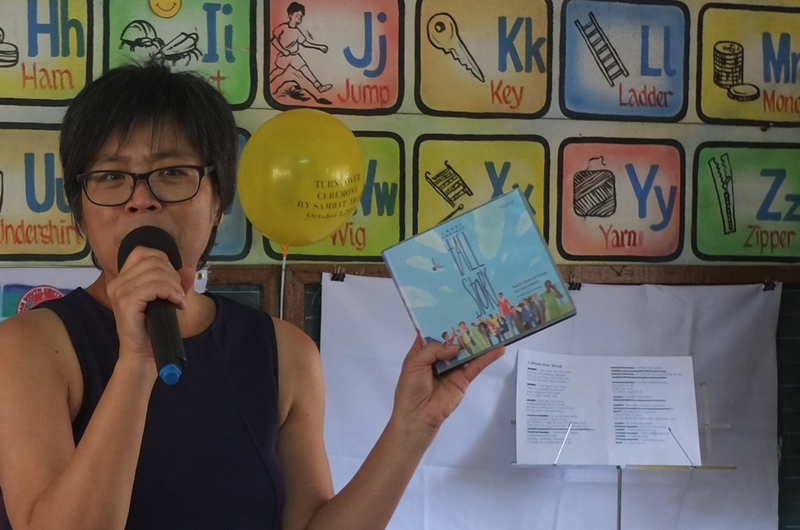 Here I am presenting the school with Christina Banach's donation of a 5-CD audio book of Tall Story. I was worried that they wouldn't have the equipment to play the audiobook, so the night before, I popped over to the shops and got them a CD player and a nice set of headphones. ... I hope the teachers will feel free to clamp the headphones on and have a listen to Tall Story. The audio book is lovely. Then it was time for Nicole to sing ... and that's when everything went slightly spangly. Nicole singing A Whole New World with math wiz Fiona. ... that the kids joined her in song. They knew ALL the lyrics. Even the mumbly ones between the notes. Afterwards the children came forward with thank you cards and read them out to me. 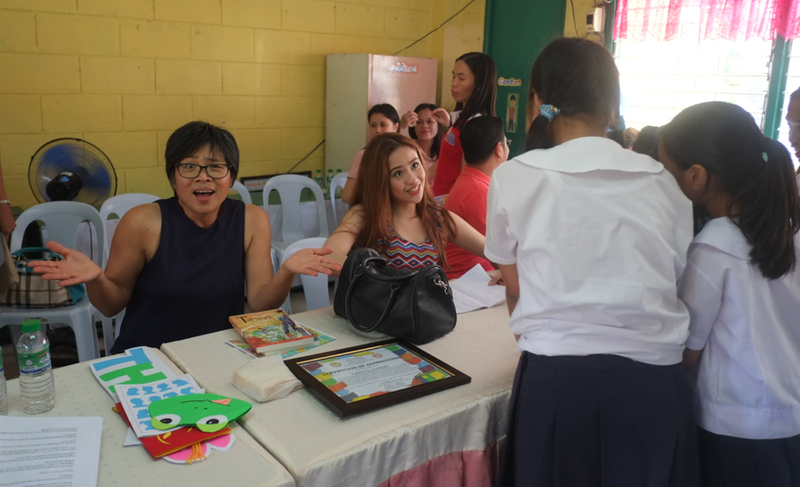 They were directed to Authors for the Philippines donors, the Siobhan Dowd Trust, Christina Banach and Tina Benipayo Andrews. At lunchtime, an autograph seeking queue suddenly formed in front of Nicole's side of the table. Just kidding. I got to sign autographs too. But not as many as Nicole. Nicole was still signing when it was time for lunch heh heh. 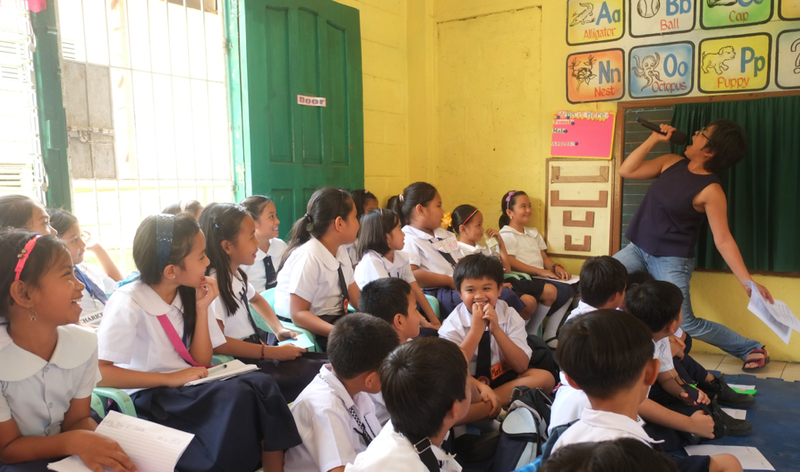 We also visited Ambulong Elementary School and donated a stack of Tall Stories, a couple of Animal Tricksters and a copy of Shine. 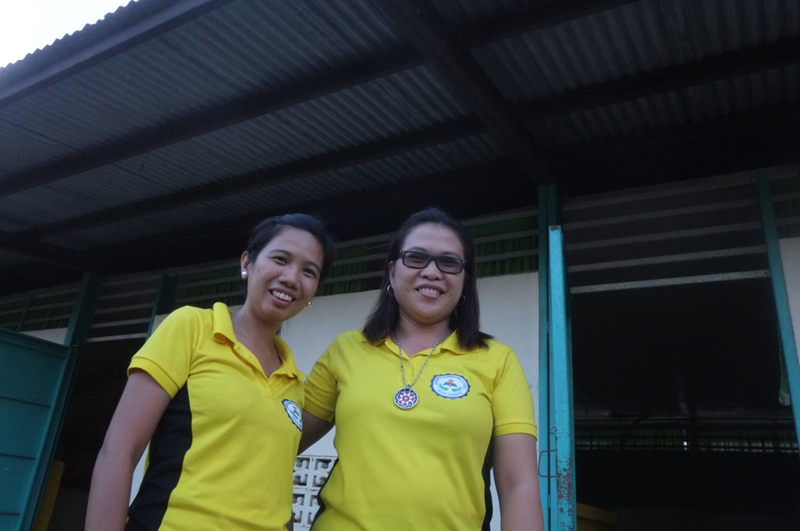 Ambulong Elementary's warm greetings for the donors. 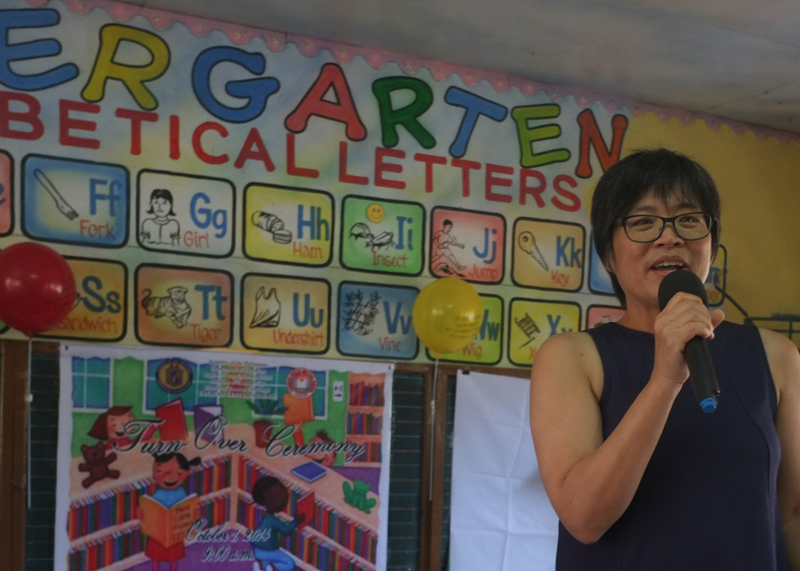 We also went to Hanopol Elementary School where the librarians told us about how Typhoon Glenda ripped the roof off their library (one of the few relics of the Marcos era with its militaristic design) and almost carried away all their books. We stocked their shelves with copies of Tall Story and they promised to take us to see the volcano lake behind the school next time we came. 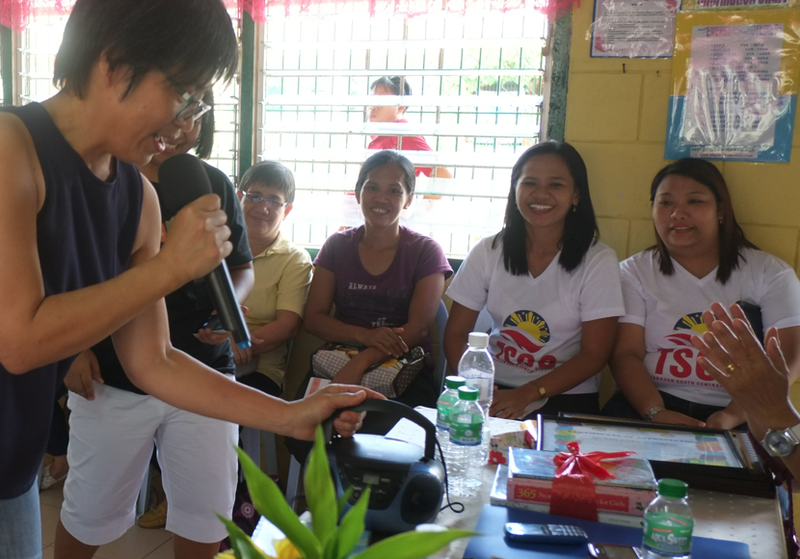 Zarah will definitely be back to train teachers and librarians soon. 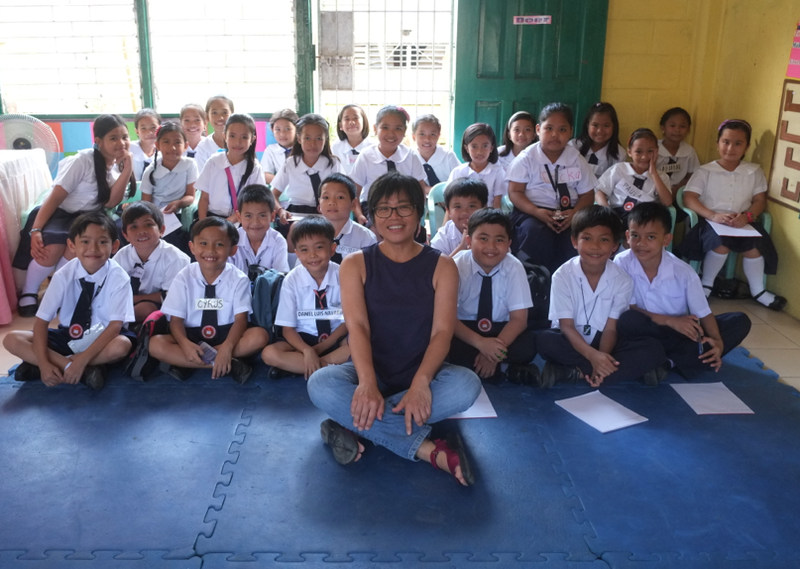 But I'm going home to England now and it's going to be another year before I'll be visiting libraries with the Sambat Trust again. I cannot wait. Meanwhile, we think we've won over Nicole to our literacy advocacy. 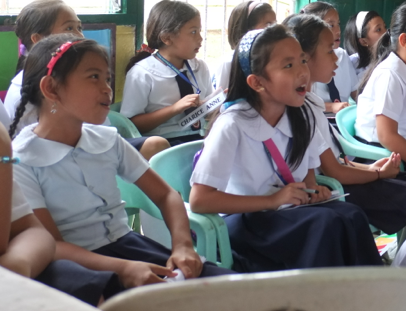 Fingers crossed there will be a lot of singing in Sambat Trust libraries sometime soon! I suddenly discovered this morning that my flight is today and not tomorrow like I'd been telling everyone. So I'm finishing this blog post off in the departure lounge while texting apologies to all and sundry. Talk about absent minded. Lucky I checked my ticket before going to bed. I've got a short video of Nicole singing in Ambulong but I've got to roll up to the plane now so I'll add it to this blog post when I get to London. Farewell to the Philippines for now. I wish I could stay longer. Lots of love to you all. Mabuhay! Thanks, Jane! There is so much one can do out there. I was sorry to leave. YAY! Would love you to join me, Chee! Till next year! Looks like a fantastic trip, Candy. Great pic of you eating dinner while your niece is still signing autographs!